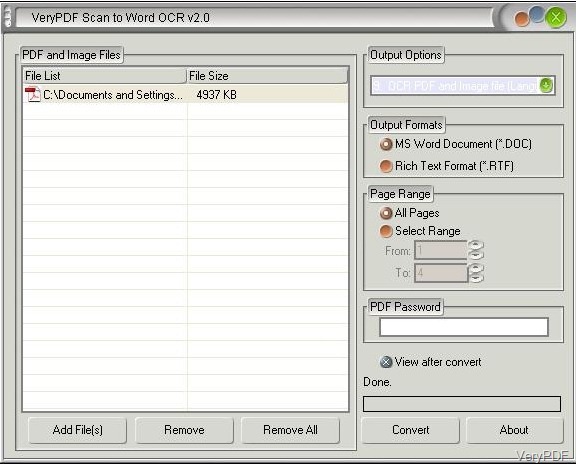 What is Scan to Word OCR Converter? 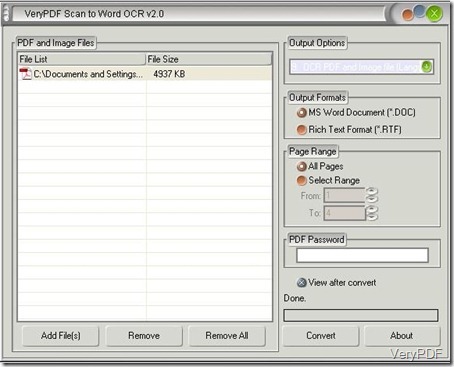 Scan to Word OCR Converter is a very useful software which is designed to help users convert the scanned images and PDF files into editable Word and RTF documents. With the advanced OCR technology, this application can support six languages recognization: English, French, Italian, Spanish, German and Portuguese. Besides, it can also help convert encrypted PDF files into editable Word or RTF documents. The users can choose the output formats, page range and different ouput layouts with the help of Scan to Word OCR. This software support run in windows 2000 and later systerms of both 32 bit and 64 bit. It support converting scanned images and PDF files in batches. It support converting specified pages of scanned iamges and PDF files only if you input the page numbers in "Page Range" group box. Support converting encrypted PDF files into the Word and RTF Ddocuments. Support converting scanned images in different languages into editable Word files when you choose the languages in "Output Options" where support six languages: English, French, Spanish , German, Italian and Portuguese. 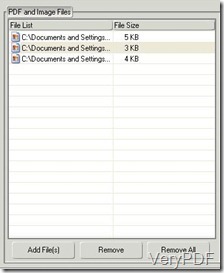 Support converting the scanned PDF files into the editable Word documents with different output layouts which are listed in the "Output Options " from 1 to 7. How to convert scanned PDF into editable Word documents? step1: Download the software to your PC and the interface shown in your desktop. step2: Add the scanned images or PDF files into the interface with the button "Add File(s)" or just drag the scanned images or PDF files into the interface. look at the pictures below. If you want to Remove some of the images or PDF files out of the list, select the PDF files and click the button"Remove " or click the button "Remove All" if you want to clear all the PDF files and images. step3: Select the related options in the four group boxes on the right side of the interface. 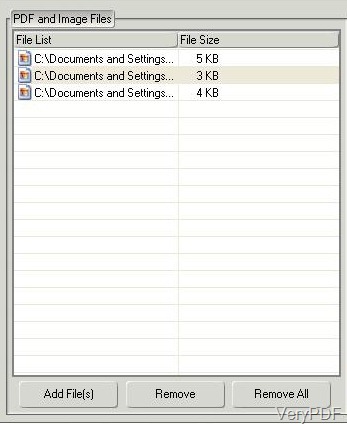 Step4: Click the button"Convert" ,a few seconds later the new Word or RTF documents will show. Users can free download this software and experience the advangtages of this software, however, only 20 times are offered and some limitation are in the trial version which will be absent in the offical version. If you have com across such problem, please experience it without hesitation. Can I convert a PDF file in Danish to PPT format? How to export a comment of a pdf file by use of verypdf pdf editor? How can I print the copies of one image on one sheet? Convert pcl to bitmap and set color depth via command line? How can I save RTF to WMF conveniently? How to convert px3 to jpeg via command line? Convert prn to bmp and set resolution via command line?